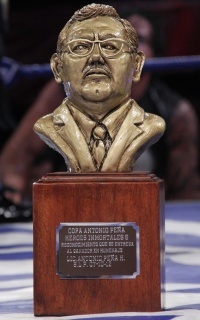 The Torneo Antonio Pena is an annual AAA tournament. It's held at the annual Antonio Peña Memorial show, in late October. The first tournament was held in 2007, a year after Pena passed away. Both the format and the trophy given out has changed over the years. For the first two years, Torneo Antonio Peña was a king of the mountain type match. Two wrestlers are randomly drawn to start the match. Wrestlers are eliminated in normal fashion, and the loser is replaced by the next random participant. The first tournament featured surprise/unannounced entrants. The first Copa Antonio Peña was held on October 7 in Toreo de Cuatro Caminos. This was also the last AAA event at that building, which was subsequently torn down. The winner of Copa Antonio Pena received a medal. This year's torneo was held on October 24, in Estadio Beto Ávila, Veracruz. Mesias was the winner, beating six straight men to win the tournament. The format changed to a battle royal, under Royal Rumble rules. Luchadors were added about one a minute. - Ultimo Gladiador eliminated by La Parka Jr. This year's format was for a rudo vs tecnico cibernetico. In addition to winning the tournament, the winner also would win the runner up's mask or hair. This year's match was held under royal rumble rules. 3 Psycho Clown Ultimo Gladiador Texano Jr.
6 Extreme Tiger Heavy Metal Texano Jr.
12 La Parka El Mesias Texano Jr.
Texano Jr. was initially announced as the winner, but was disqualified after the match for fouling Mesias before eliminated him. AAA has since listed no winner for this match. This was Hector Garza's final match. He announced his cancer diagnosis in the days after this event and would never return to the ring before passing away the following year. The format changed again in 2013. This year's tournament was a one night, sixteen luchador elimination tournament, in the traditional Rey de Reyes format. The tournament was held at Heroes Inmortales VI in Gimnasio Miguel Hidalgo, Puebla on October 18. The tournament, held on October 12, was a Royal Rumble match. The final two would have a one fall match. No one was eliminated until everyone entered. Hijo del Fantasma won a royal rumble style match held on October 1, 2017 at Heroes Inmortales XI which also included Johnny Mundo, La Parka, Rey Escorpión, Psycho Clown, Hernandez, Psicosis II, Mamba, Murder Clown, Dark Cuervo, Monsther Clown, Dark Scoria, Estrella Divina, Histeria II, Marty Martinez, Pimpinela Escarlata, and Dave The Clown. Pagano won a royal rumble style match held on October 28th at Heroes Inmortales X which also included (Kahoz, Chessman, Hijo Del Vikingo, Súper Fly, Parka Negra, Hijo del Fantasma, Espectro, Averno, Niño Hamburguesa. This was the only TV appearance of Ultimo Maldito (Kahoz) & Black Danger (Espectro) under the old characters of Antonio Pena. They were intended to be permanent changes, then dropped after one show and explained as "tributes" to Pena. This page was last edited on 31 January 2019, at 14:58.